The Kentucky Law Journal, in conjunction with the University of Kentucky College of Law, will host “Intermeddlers or Innovators? States and Federal Copyright Law,” on October 22. The symposium will take place at Gatton College of Business and Economics in Woodward Hall. This event is free and open to the public. The event will begin at 8 a.m. This symposium will have a diverse group of speakers that will address the contribution to legal scholarship by facilitating discussion among scholars working on these related issues, which implicate different doctrinal areas, including copyright, administrative law, state constitutional law, federal constitutional law, tax law, and art law. · Eric Johnson is an Associate Professor of Law at the University Of Oklahoma College Of Law. His courses include Torts, Science and Law, Antitrust, and Intellectual Property. · Adam Thimmesch is a professor at the University of Nebraska. His research focuses largely on state taxing jurisdiction and tax compliance issues. · Emily Bremmer is an Associate professor at the Law School at the University of Notre Dame. She teaches and writes in the areas of administrative law, civil procedure, and business associations. · Guy A. Rub is a professor at Moritz College of Law at Ohio State University. He is an expert in the intersection between intellectual property law, contract law, and economic theory. · Jake Linford is a Professor at Florida State University College of Law and focuses his scholarship on Intellectual Property and Contract Law. · Diedre Keller is an associate professor at Ohio Northern University (ONU) Claude W. Pettit College of Law. She has taught Property, Law and Literature, Internet Law, Legal Problem Solving and Analysis, and the Intellectual Property survey course and seminar. · Scott Bauries is the Willburt D. Ham Professor of Law at the University of Kentucky. Prof. Bauries joined the UK Law faculty as an Assistant Professor in 2008 after working as an associate with McGuireWoods, LLP, where he practiced Labor & Employment Law, Higher Education Law, and Complex Commercial Litigation. In addition to presenters discussing states and federal copyright law, students and other attendees can participate by posing questions throughout the symposium. 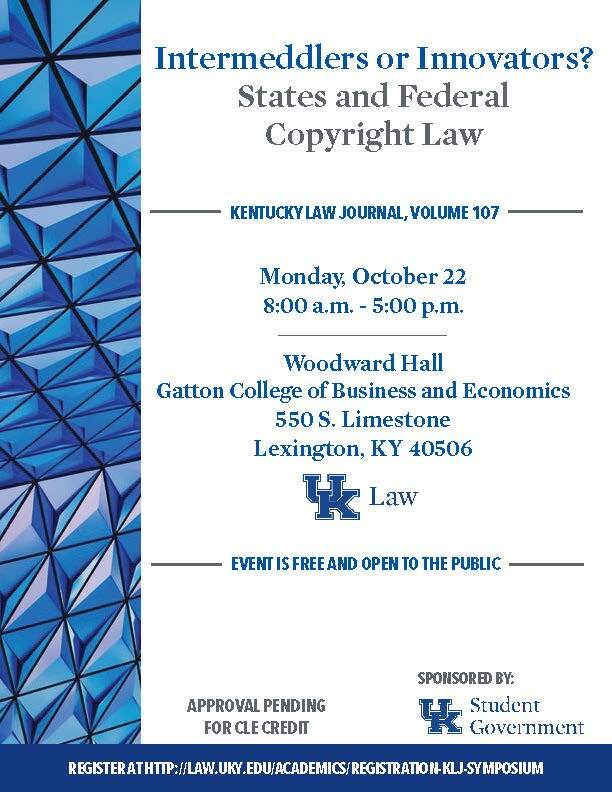 To register for the program, visit http://www.kentuckylawjournal.org/index.php/symposium/ CLE credit for the program is pending approval. See presenter biographies, directions and parking information, and a full schedule at http://www.kentuckylawjournal.org/index.php/symposium/symposium-speaker-biographies/.